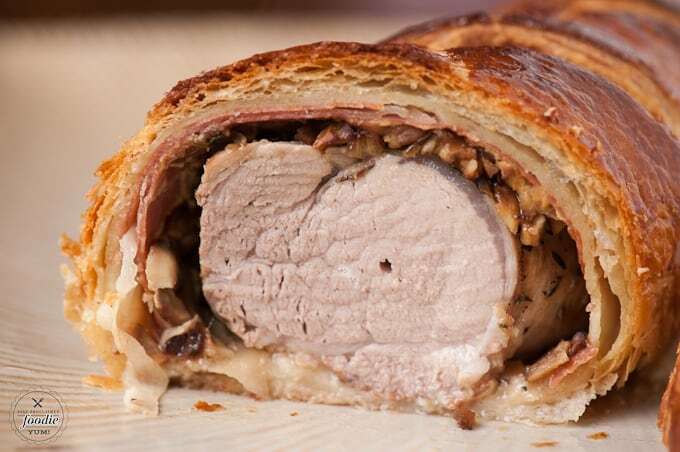 Pork Wellington is the best baked pork tenderloin recipe. 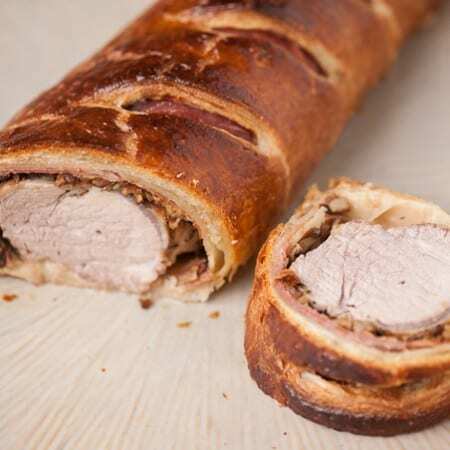 Want to learn how to make pork tenderloin wrapped in prosciutto, mushrooms, and puff pastry? Who doesn’t love pork? Why, just last night my daughter asked if we could ever just have bacon for dinner. I kid you not. 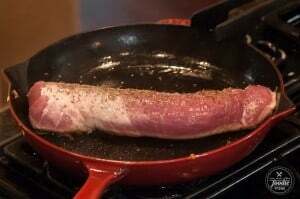 We enjoy fresh and cured pork in our house on a regular basis and one of our favorite cuts of meat is pork tenderloin. This dinner recipe features a fresh cut pork tenderloin along with the beautiful combination of puff pastry, prosciutto, dijon mustard, and sautéed mushrooms to deliver the most flavorful, moist, and downright delicious dinner that is actually quite easy to prepare. 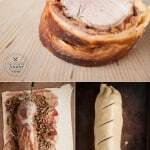 Pork Wellington is perfect to share with friends or family and an excellent main course. The process for this recipe is simple. Roll out the puff pastry so that it is big enough to wrap around your tenderloin. Cover it with a blanket of thinly sliced prosciutto, slather on some dijon mustard because we all know how wonderful pork and mustard are together, and cover that with some sautéed mushrooms and shallots. Before you add your pork tenderloin, you’re going to want to give it a nice sear in that mushroom pan to lock in all the flavor and juices. You’re starting to drool, now, aren’t you? I can tell. Wrap it all up, seal it with a bit of egg wash and then paint on some more egg wash to give that pastry a golden brown shine while it cooks. Easy! 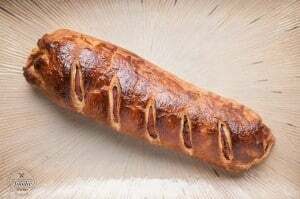 How long do you cook Pork Wellington? The first time I made a Wellington for dinner, I was a little intimidated and worried that it wouldn’t turn out. The process is not only easy, but if you use a meat thermometer, you’re sure to get perfect results. The National Pork Board advises the following temperature range when preparing pork chops, roasts and tenderloin: cook pork to an internal temperature between 145°F (medium rare) and 160°F (medium), followed by a three-minute rest. For ground pork, cook to an internal temperature of 160°F. Because you’re wrapping this beauty up in a toasty puff pastry blanket, I recommend removing it from the oven before you hit your temperature because the internal temp will continue to rise while the meat is resting. 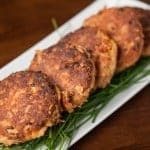 This recipe was absolutely outstanding and my entire family loved it. I’m sure yours will too. 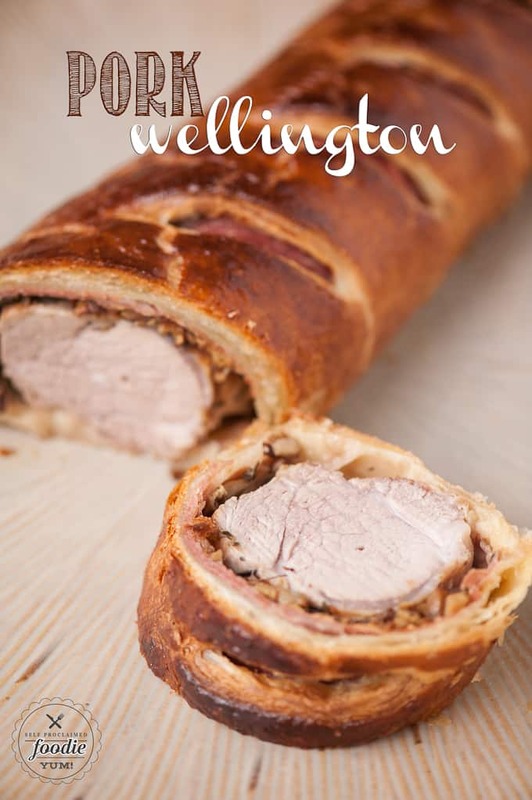 If you're looking for an easy dinner that is sure to impress everyone because of its amazing taste and presentation, choose Pork Wellington. Season pork tenderloin with salt, pepper, and dried thyme. Set aside. Roll out thawed puff pastry dough so that its as long as your tenderloin and wide enough to fully wrap around it. 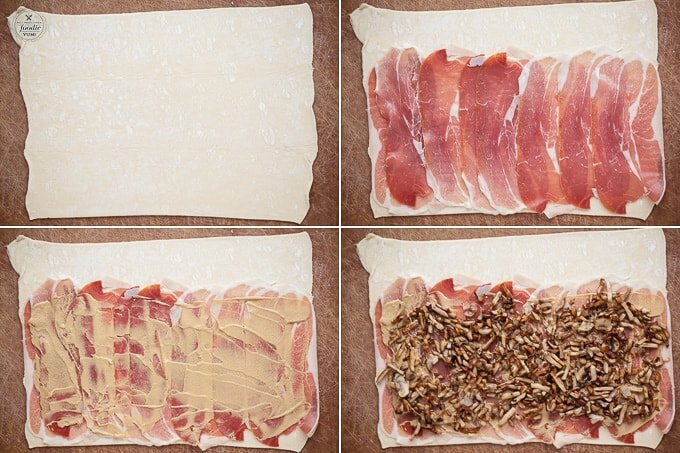 Arrange the prosciutto so that there is a thin layer covering the dough. Spread dijon mustard over the top. Spread sautéed mushroom mixture on top of the prosciutto in a single layer. Add seared tenderloin. Insert meat thermometer into the thickest part of the meat at the end - the thermometer will be able to stick out even after rolled. Roll tenderloin in dough and seal the edge with the beaten egg. 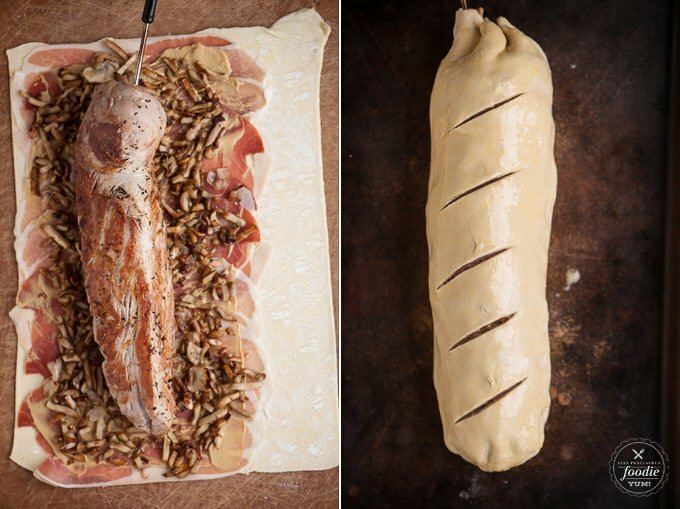 Place the wellington on a parchment lined or stone baking sheet, seam side down. Brush top of dough with egg wash and cut slits in the top to release steam. Cook in preheated oven for 20-30 minutes. Remove from oven when the internal temperature has reached between 145 degrees F (medium rare) and 160 degrees F (medium). Allow meat to rest 3 minutes before slicing. Enjoy! This post was originally created in December 2015 and has been updated with more fun facts and tidbits for your reading pleasure. Excellent recipe. 2 things: after it was packed and ready to go I kept it in fridge for 1/2 hour and second I cook it at 400F oven to 145F internal temp. Too much. I recommend 135F. Mine came like the picture but I like it a little more rosy. Great recipe. Made it last night and it came out perfectly. Thank you! Just made this tonight. Easy and fantastic! Definitely will make regularly, probably for guests. The dough did not get brown enough. The pork was great and cooked to medium. Any suggestions as to how I can get the dough brown? Sorry for the late reply. Perhaps your rack could have been higher in the oven? Or, as the meat approaches temp, broil on low for a few min? Barbara. What I usually too is apply an egg wash to ensure it’s evenly brown too. Just a single egg with a splash of water? Brush it over and I found it worked well. But yeah, your rack might not have been high enough. Made this for my daughter and her fiance last week. So yummy! Served it with an onion pan gravy. Too die for. Making it today my hubby. Can it be made day before? Then cook next day! I haven’t done that, but I don’t see why not? Perhaps I would freeze after assembly and then thaw prior to cooking. Not sure what refrigeration would do to the dough. Puff pastry is not to be refrozen and you will have much less success with having crisp pastry if you prepare too far in advance. 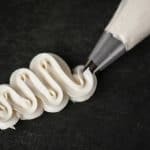 Puff pastry is delicate and too much handling, warmth, or being in contact with fillings for extended periods can stop it browning and puffing. 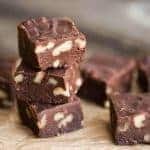 This is the recipe I have looked for. Will try tonight but husband does not like prosciutto or mushrooms so I will substitute prosciutto with bacon not sure what to substitute instead of mushrooms. Either way thanks for a great simple recipe. If it turns out like I think it will. will be telling friends. Totally great recipe I added spinach with the onions and mushrooms for a slight variation. Very good! I would love a substitute for the mushrooms too. I really hate them. Say it isn’t so! You could always caramelize onions and use those instead. I’d like to make this for a dinner party. The problem is that we’ll be driving almost 2 hours to the party. How will it hold up on the journey? I’d (under)cook it at home before leaving since it’ll continue to cook. Will the puff pastry get soggy? Would another kind of dough hold up better? Should I transport it wrapped in foil? Oven space may not be available when I arrive, but I’m guessing a few minutes to crisp it up would make it tastier. .
I’m not totally sure how it would hold up, but I would do what you suggested… slightly under cook and then heat up when I get there. Good luck! I did a trial run. Since I planned to prep the night before, I prepped and fridged it for a few hours. I then baked it to 135 degrees, wrapped it as I will for travel, and let it sit for 3 hours. When I unwrapped it, the crust was a bit limp, so I placed in oven for 10 minutes to crisp up. The pork was more well done, no pink, but I prefer it that way, It was still moist, very delicious, and a nice presentation, But no doubt, it’s best to serve immediately. this way amazing!!!! I had to strain the mushroom bc there was a bit too much liquid from them and I think I will add some white wine and cook the liquid off more next time. This is a keeper! LOVED IT!!! Thank you! 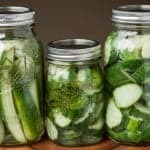 Omg- fantastic recipe! It turned out perfectly and soooo yummy! One of my new favs!